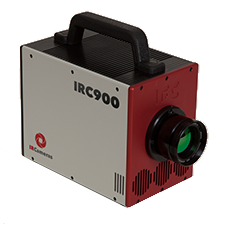 With a broad spectral response from 960 nm to 2600 nm, and the unmatched sensitivity of a cooled InSb sensor, the IRC906-SWIR and IRC912-SWIR cameras are designed to address the most challenging applications for short wave infrared imagers. More versatile than traditional InGaAs cameras, the extended wavelength response of the IRC SWIR products makes it indispensable for spectroscopy, infrared search and track, target signature, astronomy, laser detection & characterization, and other demanding SWIR imaging requirements. Based on high performance digital focal plane array technology, the IRC 900 series SWIR cameras offer both standard definition 640—512 and high definition 1280—1024 formats. These cameras operate at high frame rates with cooled InSb sensitivity, low noise and no pixel crosstalk or blooming. These cameras feature simultaneous 14-bit CameraLink and Gigabit Ethernet digital outputs, along with HDMI. GPS and IRIG-B inputs are available as options, as is a four position warm filter wheel.